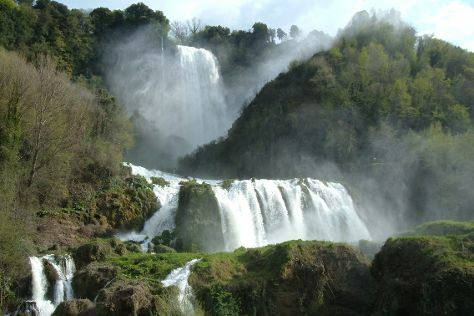 Take a break from the city and head to Cascata delle Marmore and Stabilimento Balneare Amerigo. Explore hidden gems such as Citta del Vaticano and Acqua e Sale - Stabilimento Balneare. Explore the numerous day-trip ideas around Rome: Riva di Polline (in Trevignano Romano), Duomo di Orvieto (in Orvieto) and Oasi Naturista (in Lido di Ostia). Next up on the itinerary: wander the streets of Trastevere, admire the landmark architecture of Pantheon, get to know the fascinating history of Piazza Navona, and pause for some serene contemplation at St. Clement Basilica. For reviews, where to stay, more things to do, and tourist information, go to the Rome online vacation planner . Mexico City, Mexico to Rome is an approximately 15.5-hour flight. You can also do a combination of flight and train. The time zone difference moving from Central Standard Time to Central European Time is 7 hours. In March, Rome is a bit cooler than Mexico City - with highs of 20°C and lows of 8°C. Wrap up your sightseeing on the 28th (Wed) early enough to travel to Mexico City. Visiting Chapultepec Park and Bosque de Chapultepec will get you outdoors. You'll discover tucked-away gems like Coyoacan and Basilica de Santa Maria de Guadalupe. Change things up with a short trip to Zona Arqueologica Teotihuacan in San Juan Teotihuacan (about 1h 20 min away). There's lots more to do: examine the collection at National Museum of Anthropology (Museo Nacional de Antropologia), appreciate the extensive heritage of Zocalo, browse the exhibits of Museo del Templo Mayor, and take in the spiritual surroundings of Metropolitan Cathedral (Catedral Metropolitana). To see other places to visit, more things to do, where to stay, and tourist information, read our Mexico City trip planner . Traveling by flight from Rome to Mexico City takes 15.5 hours. Alternatively, you can do a combination of train and flight. Due to the time zone difference, you'll gain 7 hours traveling from Rome to Mexico City. Traveling from Rome in March, you will find days in Mexico City are somewhat warmer (28°C), and nights are about the same (11°C). Finish your sightseeing early on the 3rd (Tue) to allow enough time to travel back home.